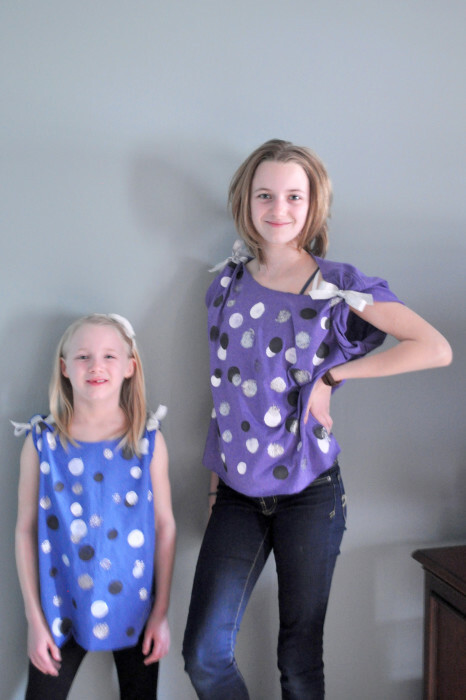 My nieces love to be crafty, but it can hard for all of us to come up with kid friendly ideas for them to make. Joann craft store had a painted t-shirt hanging up in the store, and D really liked it. It seemed like the perfect project to let her conquer. Bonus, she was also willing to make one for her sister! 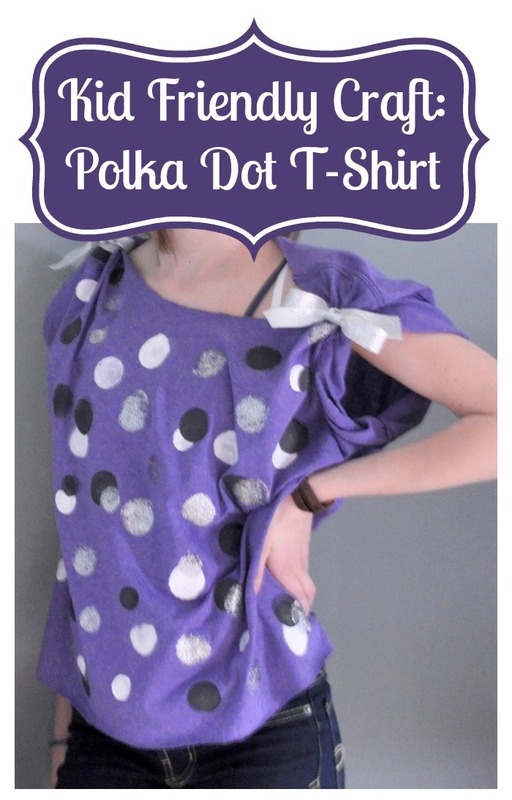 She was also really excited about being featured on the blog – so here is her Painted Polka Dot T-Shirt! 1. If the t-shirt is too long, like their’s definitely were, use a yard stick and pencil to make a straight line along the bottom of the t-shirt. D needed to take about 2 inches off. Then, follow along the line with the scissors. 2. D wanted the shirt to look a bit nicer and finalized, so we also took the scissors to cut off the collar. To help her, I made a cut on the top at both sides. It made it easier for her to navigate the round nature of the collar. I also had her use one of the seams as a “line” for her to follow. 3. 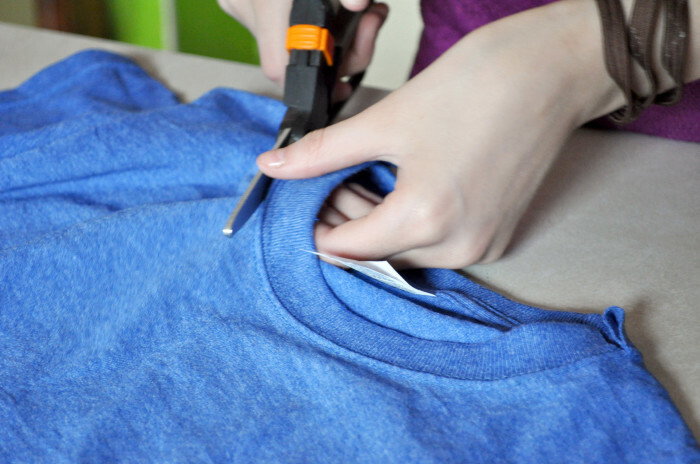 Put a layer of parchment or wax paper between the layers of the t-shirt to make sure the paint doesn’t bleed through the top layer. 4. 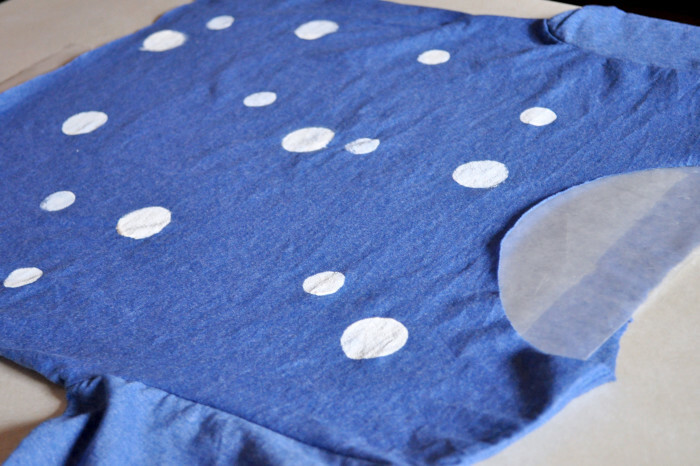 Start with one color and start making random polka dots on the t-shirt. When done, repeat with the next color and then the next. Tips I gave D before letting her go off on her own: 1, at the end, you might want to go back through and layer the colors to add more depth; 2, make sure not to have too much paint on the sponge; and 3, keep the sponges wrapped when you aren’t using them so they didn’t dry out too much. When the paint is done and dry, remove the lining. 5. Roll up the sleeves and tie with a little ribbon. And Wah-Lah! Here they are!! I tried really hard to give her tips before each step and then WALK AWAY! My favorite part about crafting is not having to be perfect. Nothing takes the fun out of it more than unnecessary pressure. It is supposed to be fun, so it’s important to just give kids the space to enjoy. She asked for help when she needed it. 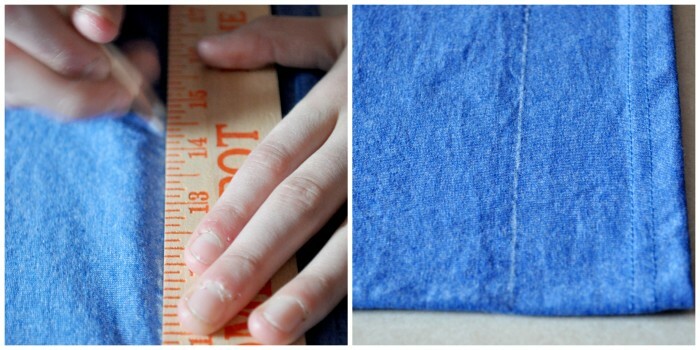 What are your favorite kid friendly crafts? That is a fun idea. They turned out so cute. These are very cute and would make a great craft for dances and such. Wow! this is so neat that you got to do it together! What a fun project. That is cute, my daughter would love this, so simple! turned out great! Those are adorable! I love polka dots! That’s super cute. I think it would make a great sleepover or birthday party activity. What a cute idea! This looks like something my daughter and her friend would’ve loved. What fun, I know my 12 year old would love to make this with her friends. Please come share this on Friday Frenzy craft and recipe linky this week. Cute idea! This is something my 7 year old would enjoy doing. I love Love LOVE the way those shirts came out!! Polka dots are my favorite. Oh this is so awesome! I would totally do this for myself!! This turned out great. What a great craft idea. Those turned out really cute! This would be a fun craft to make with my youngest over summer break. This is soo cute and looks like lots of fun to make too. My daughter would love this! Very cute! I bet my niece would love to do this craft. How creative! Great way to get the girls designing. That is such a cute idea. I don’t have a daughter, but if I did, I would totally try this.